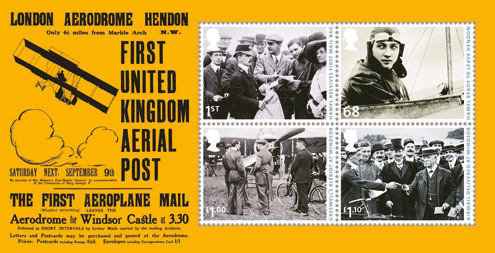 The world’s first scheduled airmail service took off 100 years ago today as part of the celebrations for the coronation of King George V. Between 9 and 26 September 1911 16 flights carried 35 bags of mail from Hendon aerodrome in North-West London to Windsor Great Park marking the world’s first regular airmail service. Today Royal Mail has issued a miniature sheet commemorating the event. This is now available from http://www.royalmail.com/aerialpost. The first demonstration of an official aerial mail delivery had taken place in February 1911 when Captain Walter George Windham had organised the first flight as part of an exhibition in Allahabad, India. After his return to Britain, Captain Windham used his experience to promote the idea of special mail flights to celebrate the coronation of King George V.
Postal officials suggested the exclusive use of specially designed private stationary for which an extra charge could be made and special postmarks be used. 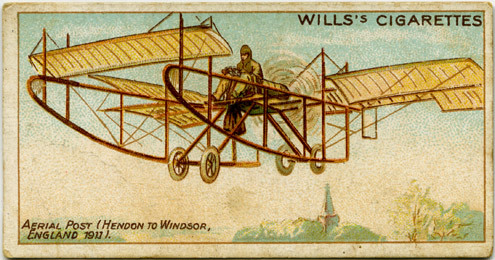 The design was created by William Lendon and featured a Farman biplane over Windsor Castle. It was sold in Harrods, Selfridges and other major department stores in London where the special postcards and letters could also be posted and collected by a private van. A huge amount of mail – about 58,000 postcards and letters – was subsequently received before the first flight took off on 9 September 1911. 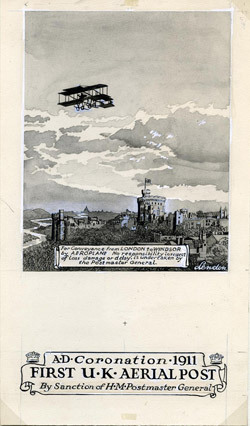 Artwork for Coronation aerial post stationery. 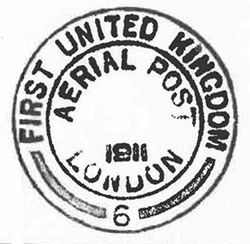 The first airmail plane left Hendon on 9 September at 4.55pm carrying one bag of mail weighing 23 ½ lbs and arrived safely at Windsor just 12½ minutes later. The mail was then taken to the Post Office in Windsor by the cycle Postman, sorted and despatched to London by the 6pm train. Four pilots were engaged to operate the Aerial Post service with Gustav Hamel performing most of the 1911 flights in his Blériot monoplane. He became one of the best-known aviators of the time but died soon after these pioneering airmail flights when he drowned in the Channel in 1914. That flying was very precarious was also proven by the accident of one of the other airmail pioneers. Frenchman Charles Hubert crashed in his Farman biplane attempting to take off from Hendon on 11 September 1911 with eight mail bags and broke both thighs. It was this uncertainty and dependency on good weather and daylight which led to the end of the Aerial Post service after these first few days in September 1911. Too many special letters and postcards had been seriously delayed due to unfavourable weather conditions, which meant that there were no further serious attempts to establish a regular airmail service in Britain before World War I intervened. However, in 1919 the first public overseas airmail service was launched between London and Paris and later extended to more distant destinations to cover the British Empire. You can see a selection of photographs from our collection showing the history of the airmail service on Flickr. Tomorrow marks exactly one hundred years since the start of the world’s first-ever regularly scheduled airmail service. To mark this occasion we have refreshed our Treasures of the Archive exhibition to include a display case full of material related to this historic event. Established as part of the celebrations for the coronation of King George V, the first flight of the Aerial Post took place on Saturday 9 September 1911. 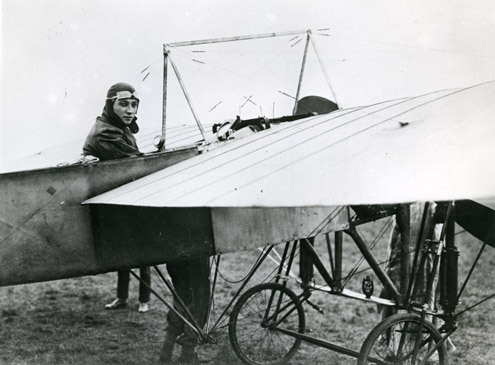 The noted pilot Gustav Hamel took the controls on the day, flying a Blériot monoplane between Hendon Aerodrome and Windsor Great Park. He carried one small bag of mail weighing 23½lbs on the flight which lasted around 15 minutes. 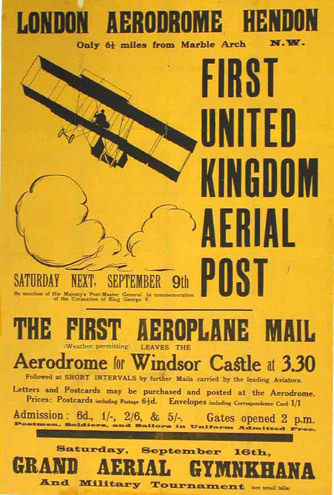 Poster advertising First United Kingdom Aerial Post. Our Aerial Post display features a number of unique items from the collections, including the striking 1911 poster promoting the flight, the artwork for commemorative postcards and envelopes carried on the flight, as well as the postcard addressed from the pilot Gustav Hamel to the Postmaster General. Original handstamps from both Hendon and Windsor will also be on display. An online exhibition, featuring a wealth of additional information about the event, can be accessed on the BPMA website. Two new products will also be released to mark the Centenary: a limited edition A5-sized postcard depicting the 1911 poster and a brand new postcard pack. Both items will be available via the online shop.